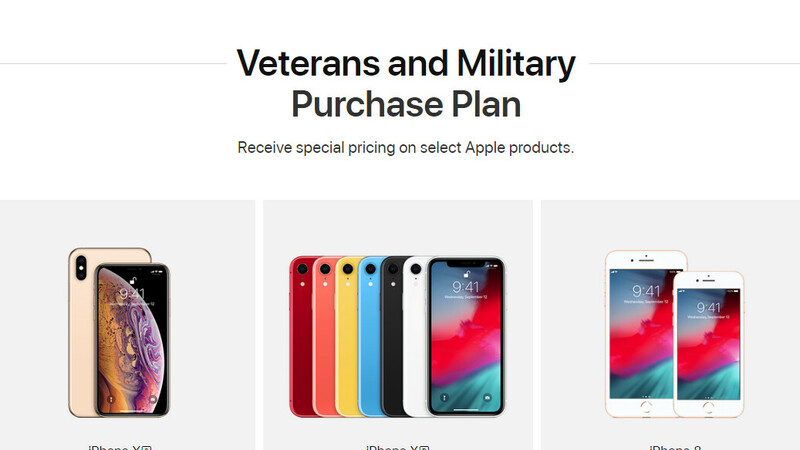 Apple has launched a new program for active military and veterans' discount in a dedicated section of its website. Different from Apple's educational discounts, it still offers 10% off plenty of new gadgets, including iPhones. The handsets, for instance, start from just $404 for a brand new iPhone 7, and the new iPhone XR can be had for $674 instead of $749. Needless to say, the largest XS Max has the largest absolute discount, bringing it down to a sub-$1000 price which is unattainable for members of the general public. You have to be an active duty member of the US military or a vet to take advantage and Apple warns you as much before you enter its dedicated store. After that, however, a few clicks will get your shiny yellow iPhone XR delivered to your door in no time at 10% off the sticker price. So how is Apple able to offer this? Is the US Govt, subsidizing the rest of the cost? Believe me, Cook and Trump are scratching each others backs. This isn't Apple just being nice. However, it troops have a duty to protect our country and our country and its corporations should all provide similar benefits. After all, many corps directly benefit from the Govt. I am pretty sure part of the discount is paid by charity tax returns, not to mention very cheap publicity and they still make a very good profit on them. It's not like they are selling millions of phones this way. Or maybe, just maybe, it actually is Apple being nice? Techie, your conspiracy theories never fail to amaze us. Conspiracy? Yeah you probably actually believe men who live in the desert, cause 9/11. Right? You think the Government won't help out it's own corps? I guess Obama didnt overturn an ITC, where Apple was guilty of stealing Samaungs IP. Which is why Samsung took it to the Supreme Court, because then the President can't change it. Just because you don't believe something, doesn't make it true. I have a right to believe whatever I want. But here is a fact for you. For profit corporation do what they can when it comes to money. Including screwing you over. And they have done so and the Government doesn't always protect like always as a consumer. This has been proven with SEVERAL lawsuit against Apple where they were clearly dead wrong and the Government who owns the courts sided with Apple against consumers. So you can't tell me otherwise. Dont question others beliefs simply because you don't believe. After all do you have a better option? No, you simply choose to believe Apple is some angelic entity and they are not. They are as evil as a ynother greedy corporation. Please, if not for us here in these forums, then for the sake of your family please set up an appointment with Dignitas ASAP. I am a vet. It is just a publicity stunt to bring in pro vet customers. Corporations do it all the time. Pro veteran business all cash in on veterans. I ain’t mad at them I use Apple products. Just being real. A publicity stunt is a harsh claim to leverage. But it’s definitely not out of the kindness of their hearts. For them, this move is strictly about company perception. Good companies like to demonstrate that they care about certain segments of our community to give the appeal that they’re worth buying from. Thank you Apple for the love and support. It is greatly appreciated.